An ideal volatility investment would hold its value during quiet times and then ride volatility up as the market panics. Barclays’ VQT and Invesco’s PHDG are two Exchange Traded Products (ETPs) that are designed to fill this need. 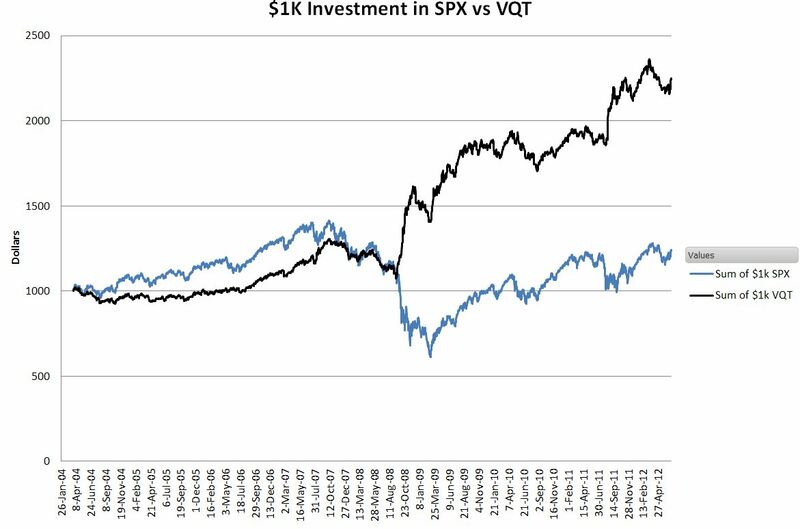 These two products use the same methodology but differ in that VQT does not distribute dividends, effectively automatically reinvesting dividends, while PHDG distributes any dividends quarterly. The rest of this post is about VQT, but PHDG will be very similar. 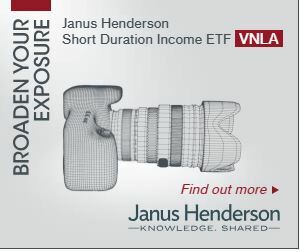 Be aware that Barclays has one other fund, XVZ, that attempts to address this need another way. 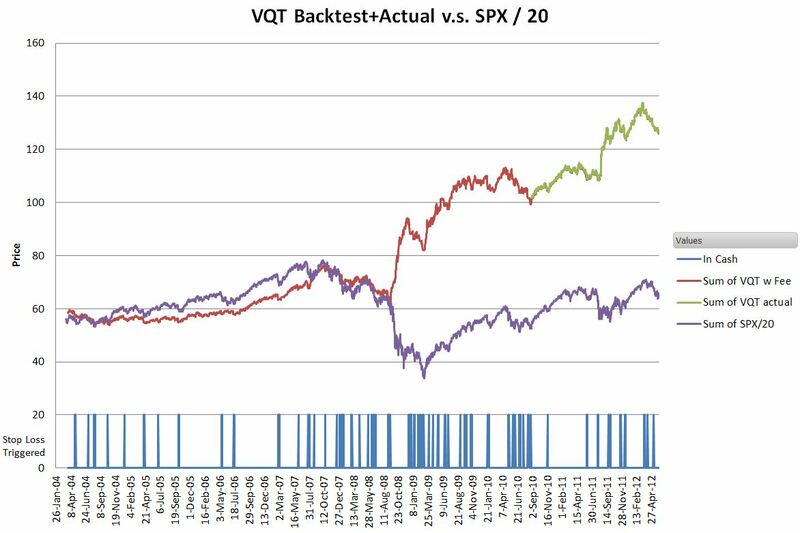 I created a spreadsheet to simulate VQT’s allocation methodology (click here for more information) and then backtested the fund’s performance back to March of 2004—the beginnings of VIX futures trading. The results are shown below, compared to an equivalent investment in the S&P 500. Impressive. Of course, past performance is no guarantee of future success—UBS’s XVIX and VQTS are examples of now-defunct volatility funds that backtested great, but went nowhere after their introduction. VQT also has a panic room. If the fund drops 2% or more in the last 5 business days it triggers a stop loss that shifts everything to cash for up to 5 days. By monitoring the S&P 500’s volatility and trends in the CBOE’s VIX index VQT’s algorithms determine which of the 5 non-panic settings to use. The S&P 500’s historical volatility for the last month is the big knob, and then volatility trends are used to tweak the settings up or down one. 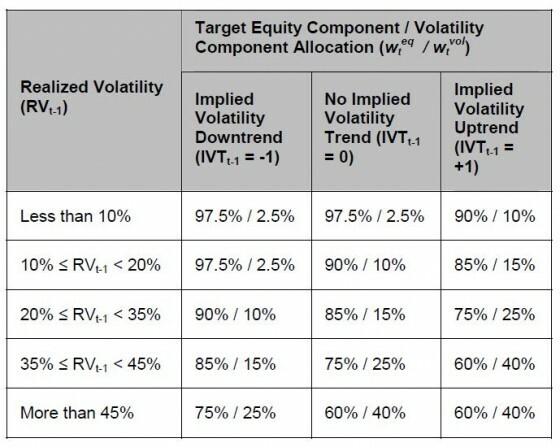 The realized volatility breakpoints are 10%, 20%, 35%, and 45%. 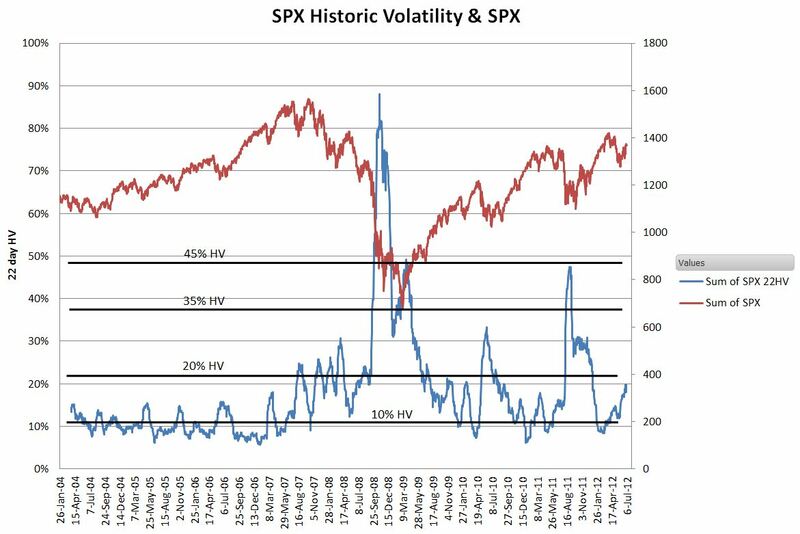 The chart below shows the S&P 500 volatility compared to these trigger points since 2004. The SPX itself is shown also; its scale is on the right. 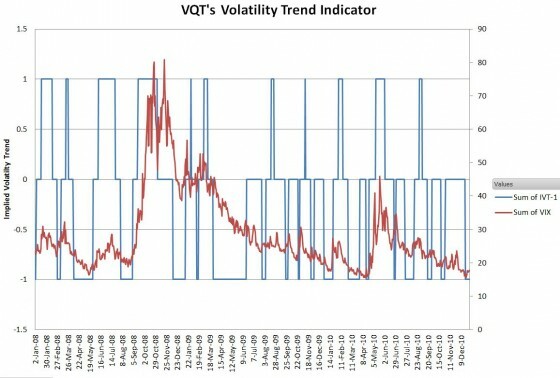 The volatility trend metric that VQT uses monitors the 5 and 20-day moving averages for VIX. If the short term average is higher than the longer term average for ten days the trend is judged to be up (+1), and if the long term is higher than the short term the trend is down (-1). Otherwise, the trend variable is set to zero. 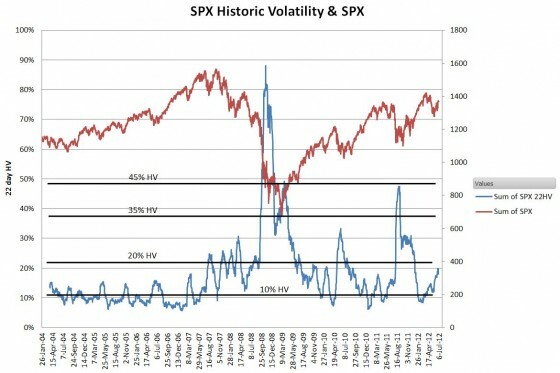 The chart below shows the volatility trend indicator compared to VIX during an “interesting” period that includes the 2008/2009 meltdown and the Flash Crash. 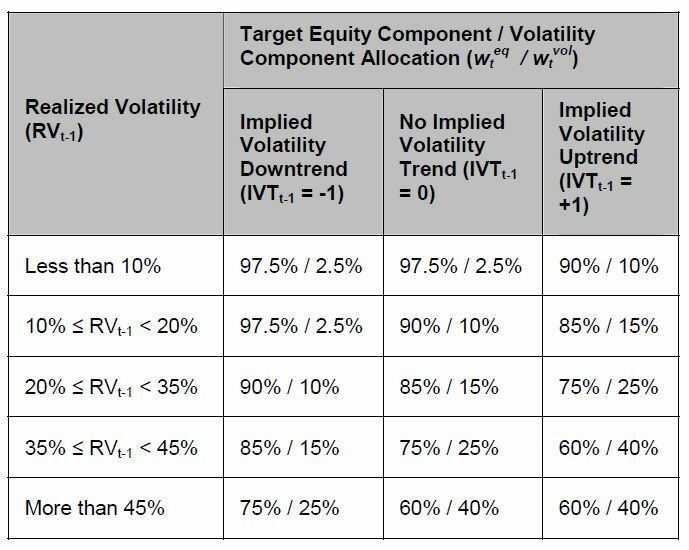 The matrix below, taken from Barclays’ prospectus, shows VQT’s non-cash settings determined by S&P 500 realized volatility and VIX trends are shown below. 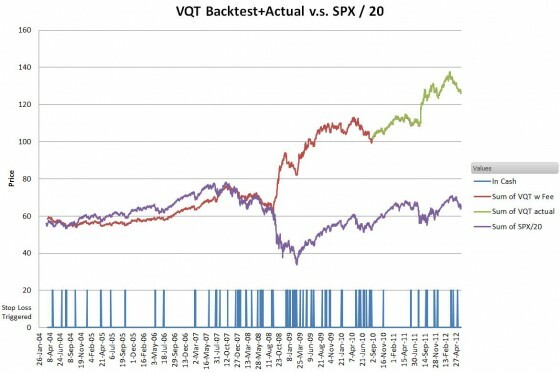 In addition to these settings, there’s the 100% cash stop loss allocation of VQT, which occurred a surprising 156 times in the eight-year span I evaluated—7.5% of the time. The chart below shows that this shift into cash, while most prevalent during the 2008/2009 crash, can occur frequently in both bull and bear markets. My simulation shows the VQT stop loss being triggered 108 days, 2/3rds of the total number when the S&P 500 was dropping and the volatility trend was flat or increasing—so scenario #1 is the most common. The stop loss feature makes VQT the best of the hybrid strategy ETNs in reacting to fast volatility spikes. The equity/volatility allocation knobs are tied to SPX and VIX moving averages are inherently slow to react, but the stop loss feature triggers quickly, moving the fund into cash after a single down day of 2% or more. 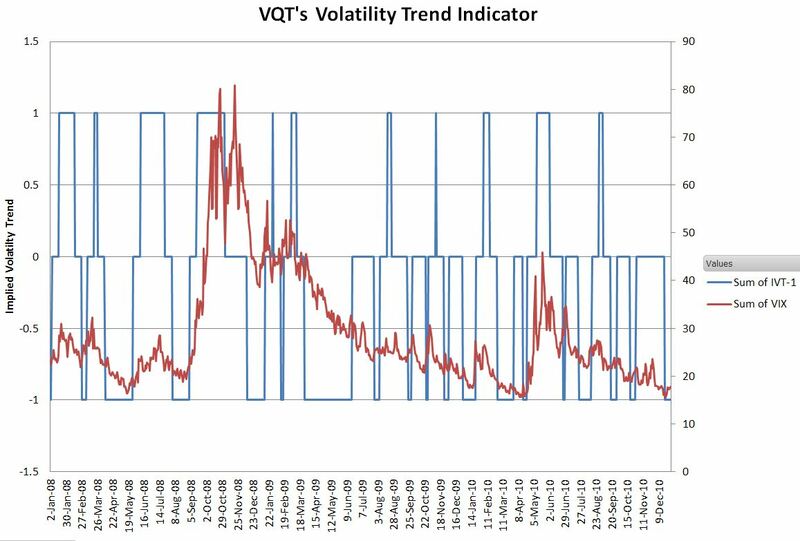 VQT won’t benefit from the initial spike, but the pause buys time for the allocations to adjust to new market conditions. After its inception on August 31, 2010 VQT performed well initially—in the July/August 2011 market correction, when the S&P 500 lost 13%, VQT was up 5%, an impressive performance. But that was the end of the glory for VQT, it has performed poorly since then, mostly I suspect because it’s always at least 2.5% long on volatility—which is a major drag during an overall bullish market. With its strategy of aggressively going long volatility during bear markets it should do very well the next time the bear comes around, but until then don’t expect much. It’s odd when holding a primarily long equity position to hope for a market crash, but with VQT a market panic is not something to be feared.